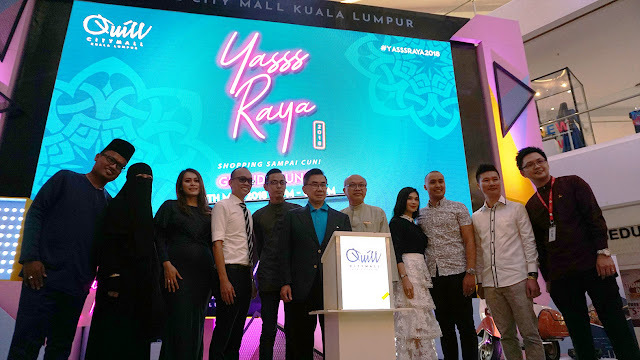 In conjunction with Ramadhan and Hari Raya Aidilfitri celebrations from 17 May 2018 to 12 June 2018, Quill City Mall Kuala Lumpur, a family and kids friendly shopping destination along Jalan Sultan Ismail Kuala Lumpur was honored to present the momentous celebration of the grand launch of “Yasss Raya 2018”. In the theme of one of Malaysia's biggest festival celebration, Yasss Raya 2018 was adapted from the current modern trend of Raya which involves modernised Raya decorations. This Raya, shoppers are sure to be delighted with the amazing Yasss Raya 2018 decorations in Quill City Mall KL. 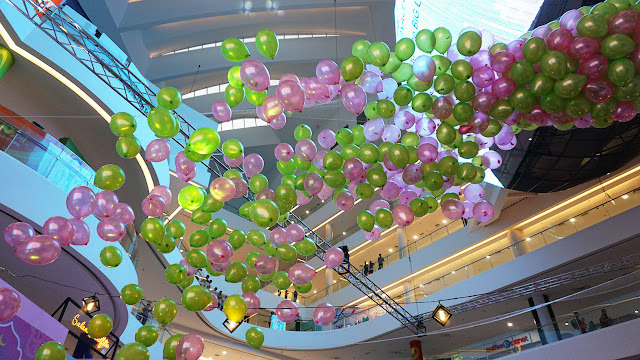 Instead of using a ‘balik kampung’ theme, shoppers and visitors were greeted with a modern theme comprising of pastel colours and neon lights; a semi hipster decoration. Discover fashion collections for the young of more than 1,000 Raya collections and more than 40 booths comprising of clothes being sold by semi hipsters and youngsters. Shoppers and visitors who are looking for new clothing for this Raya, you may purchase attractive clothing by famous celebrities collections from Rozita Che Wan, NSA Beauty Official, Mora & Haze, Calaqisya, Lily Petuna, Minaz, Teratak Delights, Shelle’e Belle’e by Azura Couture, Furby & Sugar, Anzel Hair, Gajah Duduk, Petra.Rtw, El.Elfiraloy, Dlasha, Fana Couture, Dyxy Cosmetic, Losravelda, Ashh & Annas, De’ Gemilang, Di Moda Closet, Jelitasara, and many more. The Raya fashion booths are located at the Main Entrance and Main Atrium of the mall. Get the latest Raya fashion trends and snap a photo of yourself while sharing them to your friends now. The Raya theme this year revolves around a happening and an amazing Raya feel thus leading up to the name of the entire campaign itself, Yasss Raya. Plenty of sharp, bright, vibrant neon lighting effects can be seen lighted up at the Main Atrium. There are grass carpet areas at the Main Atrium for family and youngsters to Buka Puasa and have a ‘santai’ session (chill out session) on the grass with colourful bean bags. An open concept as well as freedom for youngsters to gather around and socialise among each other whilst being surrounded by latest fashion collections in town. The entire atmosphere is decorated with festive sparkling lights which portrays a warm feeling of excitement and Raya festivity which is the right location to selfie or wefie with friends. Shoppers and visitors alike will be awed with the largest LED screen in the mall presenting all the latest Raya collections. We make the change for the young and lead the fashion trend. Everyone who is following the trend, please come over. Quill City Mall presented this launch to members of the media, partners and shoppers; a very grand Raya launch in town. The grand launch of Yasss Raya 2018 began with an opening dance performance. Thereafter, Dato’ Ar. Michael Ong, Group Executive Director of Quill Group of Companies delivered a Raya speech during the grand launch to welcome members of the media, friends and shoppers. Dato’ Ar. 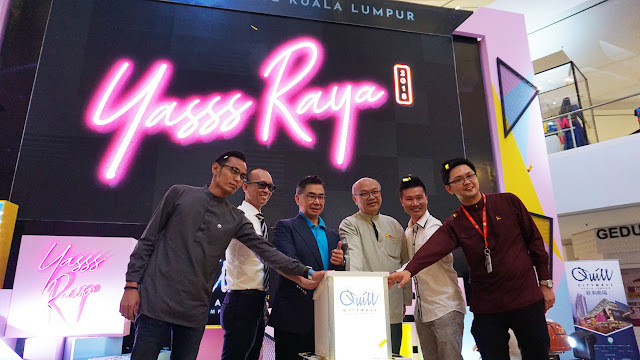 Michael Ong, Executive Director, Dato’ Lee Fong Yong, Director, Quill Group of Companies, Mr. Alan Cheong, Centre Manager of Quill City Mall Kuala Lumpur and Joseph Teo, Vice President, Marketing of Quill City Mall Kuala Lumpur officiated this launch subsequently. IamNEETA, a Malaysian band of three musicians serenaded some songs leaving shoppers and visitors enthralled. In addition, the artistes appeared during the launch are Annas Easkey, Anzalna Nasir, Azura Mazaruddin, Hafiza Hamid, Hafiz Mahamad, Yaya Zahir, Rafidah, Yana Khairuddin and Hazwan Faiz. 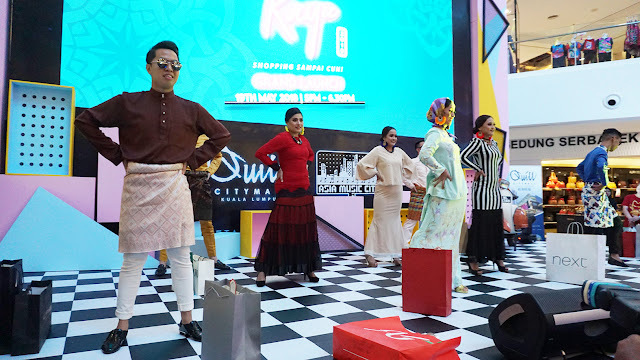 A youthful and trendy dance performance featuring latest fashion style of dance electrified the atmosphere of Raya in the mall and captivated shoppers as well as visitors. “I would like to thank the young celebrities who have contributed in presenting their latest fashion collections during our Raya campaign this year. It is our great pleasure to host this celebration of Yasss Raya 2018 Grand Launch and Corporate Social Responsibility (CSR) initiative. The children were later treated to a scrumptious Buka Puasa meal at Aragan Yokocho, a new Japanese restaurant serving authentic Japanese food - the first and largest authentic Japanese restaurant in Asia. The restaurant provides a dining area which is sectioned off into four distinct seasonal themed seating areas featuring the four seasons in Japan: spring, summer, autumn and winter. Shoppers can come and experience a four season Buka Puasa dining here as well. Live performances and artistes appearances will be featured during the launch and on selected dates throughout the campaign namely from Annas Easkey, Anzalna Nasir, Azura Mazaruddin, Hafiza Hamid, Hafiz Mahamad, Yaya Zahir, Rafidah, Rozita Che Wan, Yana Khairuddin and Hazwan Faiz which will sure to set the stage alight during Yasss Raya 2018 celebrations. Don’t miss out your favourite artistes’ appearance during our Raya campaign. Shoppers and visitors will have the opportunity to meet your favourite celebrities during the campaign. Refer to appendix attached. Unique Raya Redemptions of Yasss Raya Packets, Yasss Raya Lucky Grab, Carousel Ride, Yasss Raya Photo Contest and much more awaits you at Quill City Mall KL. Stand a chance to redeem limited edition redemptions and win attractive prizes during Yasss Raya 2018 when you drop by to Quill City Mall KL. T&C Apply. Refer to appendix attached. For Yasss Raya Photo Contest, shoppers and visitors can expect to have a memorable moment by taking photos with their friends and family while celebrating Raya in the mall. Cool and trendy decorations are all set up for photo taking purposes. Not to forget, our Shop, Dine and Win 3.0 contest is from 18 May until 29 July 2018 featuring prizes up to RM15,000 to be own. Come and shop for your Raya essentials and stand a chance to be one of the many lucky ones to win the weekly prizes lined-up for shoppers. Triple your happiness with Mega Sale, Earn AirAsia BIG Points & win weekly prizes. Three (3) lucky winners will be randomly selected once in every 2 weeks. For Shop, Dine & Win 3.0 weekly prizes, refer to appendix attached. This Raya, Quill City Mall is the best choice to gather with family and friends as shoppers can enjoy festive Raya offerings from our valued tenants with various promotions ranging from food, fashion, entertainment and much more. Get your Raya goodies from our tenants and local artist booths namely Modemarket, NSA Beauty Official, Mora & Haze, Calaqisya, Lily Petuna, Minaz, Teratak Delights, Shelle’e Belle’e by Azura Couture, Furby & Sugar, Anzel Hair, Gajah Duduk, Petra.Rtw, El.Elfiraloy, Dlasha, Fana Couture, Dyxy Cosmetic, Losravelda, Ashh & Annas, De’ Gemilang, Mahligai Touch, Perfume Palace, Di Moda Closet, Peste, Jelitasara, Rozita Che Wan and many more. From 17 May 2018 to 24 June 2018, shoppers can earn 2X BIG Points in every store to fly AirAsia. Shoppers get to redeem 4 BIG Points for every RM1 spent on weekdays and 2 BIG Points for every RM1 spent on weekends at any outlet in Quill City Mall KL. Also, movie goers in Quill City Mall KL can enjoy a GSC exclusive of 3X BIG Points. Shoppers get to redeem 6 BIG Points for every RM1 spent on weekdays and 3 BIG Points for every RM1 spent on weekends at any outlet in Quill City Mall KL. Members can accumulate points in exchange for air tickets, starting from 500 AirAsia BIG points. With BIG Points from as low as 50 to 500, shoppers can travel to destinations such as Alor Setar, Penang, Jakarta, Surabaya and more. T&C apply. Do get a copy of our Yasss Raya 2018 booklet for further details of our Raya campaign.